Review: I'll admit, I'm a little zombie-crazed right now. I watch the Walking Dead, run using an app called "Zombies! Run!" and obsessively read zombie-related literature. That being said, Something Strange and Deadly was a zombie book that didn't quite fit into the zombie pop-culture genre and I'm still not sure how I feel about it. I think the main thing I wanted to point out is that the zombies were...normal? The book clearly takes place in a parallel universe where things are, for the most part, relatively the same. The only difference is that every now and again a corpse reanimates in a cemetery and no one bats an eye. Bells placed by graves (they used to do this in our world to avoid burying people alive- a 'deceased' person would ring the bell if they woke up in a coffin (which sounds absolutely horrific if you ask me)) alert the people in Eleanor's world that a corpse has woken up. The catch here is that beyond this occasional and normal reanimation, the zombie infestation that plagues the characters was not the result of some mysterious plague or disease. They were brought back to life by a necromancer, which definitely does not feature zombie pop-culture today. Beyond the zombie commentary, I found the characters to be likable and interesting for the most part, but poorly written for the other part. I didn't feel like I knew any of the characters. This is completely random, so forgive me, but if the end of the book had revealed that every single character was a schizophrenic creation straight out of Eleanor's mind, I wouldn't have been surprised in the slightest, despite the fact that mental illness had no bearing in the story and such a revelation would have been akin to a "and then she woke up" type of ending. They just seemed like props to the story. Eleanor was a strong main character and the others were incredibly weak in comparison. The stark contrast here hampered the story. As for the story itself, it was interesting enough. It was a weird mix of science and black magic, which was vaguely off-putting (I tend to like books that stay solidly in one camp or the other) but I still managed to finish the book and enjoy it just fine, even though it took me much longer to read. I've discovered that the rate at which I finish a book correlates quite strongly with how good it is. If it's good, I'll finish it within the day. If it's average, like this book, I'll finish it randomly over the course of a week. This was a book that took me about a week to read. The pace of the story was frenetic in some spots and slow and repetitive in others which meant that I would read through the fast spots and put it down during the slow spots. I like it when books have a steady, building crescendo. Also, you can completely predict where the plot is going (at least who the necromancer is) by the end of the second page. Overall, it was a little better than average, but nothing superb. 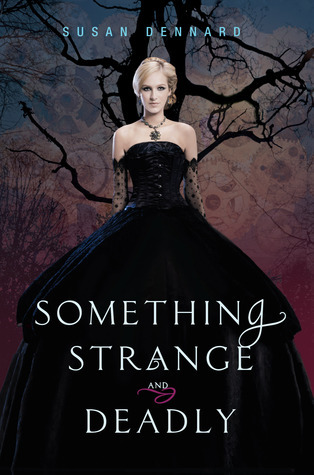 0 Response to "Something Strange and Deadly-- Susan Dennard"